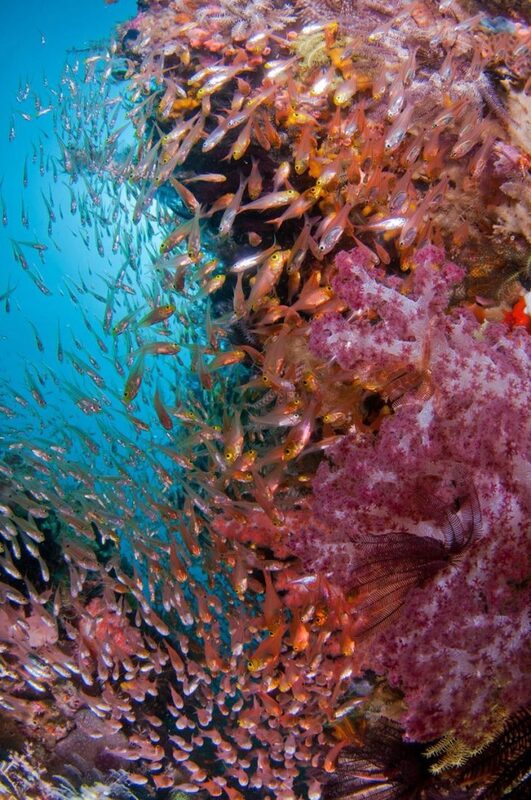 The best scuba diving in Indonesia is found in the far eastern archipelago of Raja Ampat. This cluster of 1,500 islands sits inside the coral triangle, an area known to have the richest marine biodiversity on the planet. There are at least 1,500 known fish species 537 known coral species, dozens of shark species (including the rare Wobbegong) as well as numerous mammals like dolphin, dugong and sperm whale. 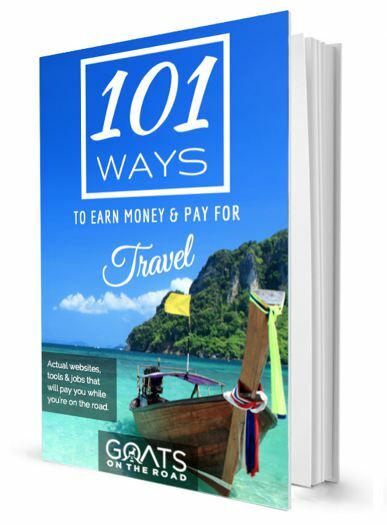 I was fortunate to be invited as a blogger for Goats On The Road to take part on the epic Trip of Wonders 2017 by The Ministry of Tourism of Indonesia. Raja Ampat was our third and final stop on the trip and I was ecstatic that the final spot was in one of the best dive locations on Earth, but at the same time I was sad to see such an incredible journey coming to an end. The entire trip started with diving in Alor where we had some of the best visibility and most abundant fish life, then we went to do some diving in Komodo where I finally got to see manta rays, and the final stop was in Raja Ampat. I really can’t express how blessed I felt to be invited on this trip and to be able to experience this once in a lifetime diving expedition. 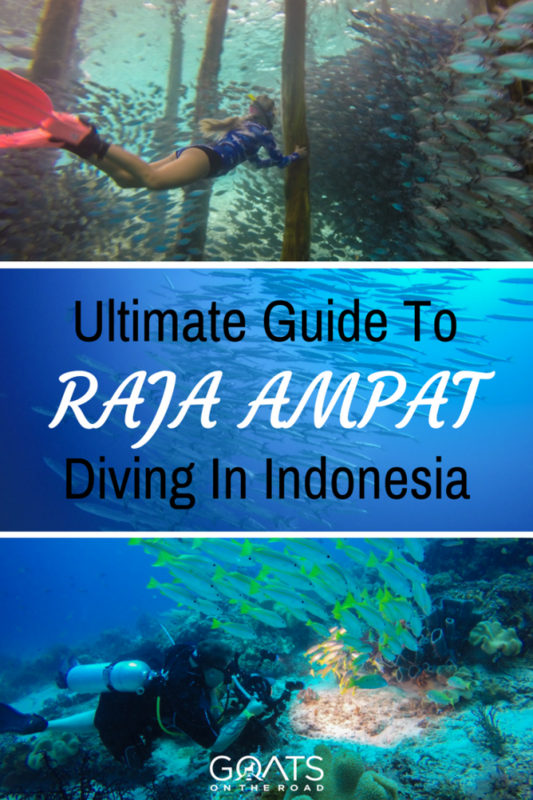 In this article, I’m going to share a bit about my experience on diving trip in Raja Ampat, but also share with you all of the prices, transportation and logistics of the trip so that if you want to plan a similar dive trip to Raja Ampat, you can do so easily using this guide. Our plane landed at Sorong airport, the main gateway to Raja Ampat. We flew in from Komodo, so we had a long journey including 4 flights and an overnight layover, but most people who visit Raja Ampat will come from Jakarta or Bali, so I’ll include those logistics here as well. We flew from Labuan Bajo to Denpasar to Makassar and finally onward to Sorong (Raja Ampat). The journey took us 2 days as we had an overnight stop in Makassar. If you were to do the same trip, you could likely complete it in a day, but it was nice to take a break mid-way as it’s a lot of flying! If you’re flying from Bali, you will likely stop over in Makassar and a round trip flight will likely cost you between $180 – $200 USD depending on the season. The first lag will be from Bali Denpasar (DPS) with LionAir / WingsAir and will head to Makassar Sultan Hasanuddin International (UPG). Srawija and Garuda Air are likely the airlines you’ll fly with from Makassar to Sorong as they are the best airlines that have single stop flights to Raja Ampat. The layovers in Makassar tend to be quite long (8 hours in Makassar) on the way to Raja Ampat from Bali, but the return layovers are usually shorter (3 hours in Makassar). Garuda and Batik Airlines both have flights with 2 stops that actually take less time than the 1 stop flights (10 hours total). There are plenty of non-stop flights from Jakarta to Sorong (CGK-SOQ) with a duration of around 4 hours and fares range from $150 – $220 USD. In my searches, I found that the non-stop flights are run by Batik Air, Xpress Air and PT Nam Air and are often cheaper than multi-stop tickets. After our flight landed, we hopped on a bus that took us to the Sorong Ferry Harbour where we waited around 30 minutes for a private boat that took us to Raja Ampat Dive Resort (aka R4DR) which I highly recommend. Note: We are not sponsored by Raja Ampat Dive Resort and I have absolutely no obligation to write positively about it in any way. 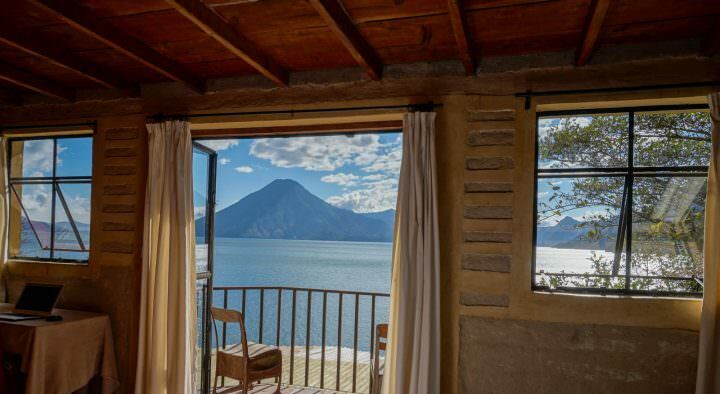 I just loved this place so I’m recommending it as a great place to stay. Getting to Raja Ampat Dive Resort is easy if you take the private option that we did, but this is the more expensive option. If you want to do it on your own you can save some money by going doing it independently. To get from the Sorong Airport to the Sorong Ferry Harbor, you’ll have to take a taxi (around 100,000 IDR / $8 US). There are plenty of taxis waiting at the airport. 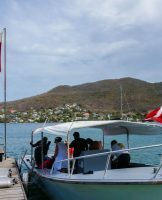 Once at the peir, head to the building that says “LOKET” (ticket sale in Bahasa), and purchase a ticket to Waisai Harbor with Express Bahari Ferries. The cost will be around 130,000 IDR / ($10 USD) for economy or $250,000 ($19 USD) for VIP. From Waisai you can call the Raja Ampat Dive resort to come pick you up in a speedboat or prearrange the pickup time when you buy your ferry ticket. 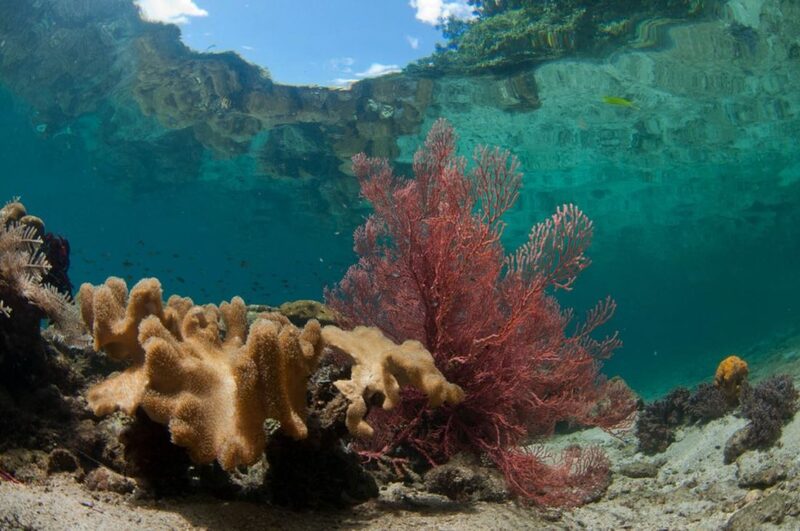 Why Raja Ampat Dive Resort? Once you arrive at R4DR, you’ll see why I recommend it so highly. 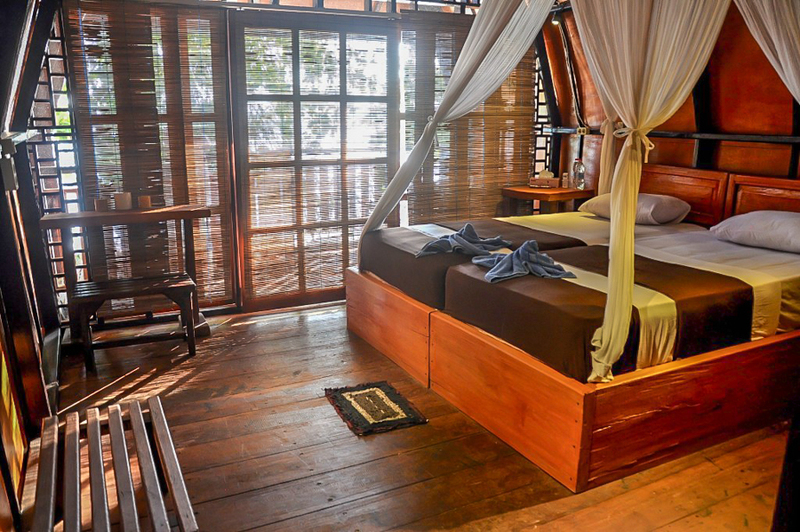 A row of 12 bungalow-style rooms sit in a secluded cove backed by a towering wall of lush jungle. Hidden within the tangled branches, right on the powdery sand you’ll find your rustic, but comfortable accommodation. Well-built beach huts with beautiful decks looking over the calm sea greet you here. There are two massive jetties that stretch out into the coral-covered cove, while a funky beach restaurant complete with beanbag chairs and hammocks is where you’ll likely spend most of your above water time. Two swings dangle just inches above the crystal clear water, creating a scene that seems to be made specifically for Instagram. Yes I loved R4DR and yes, I want to return. 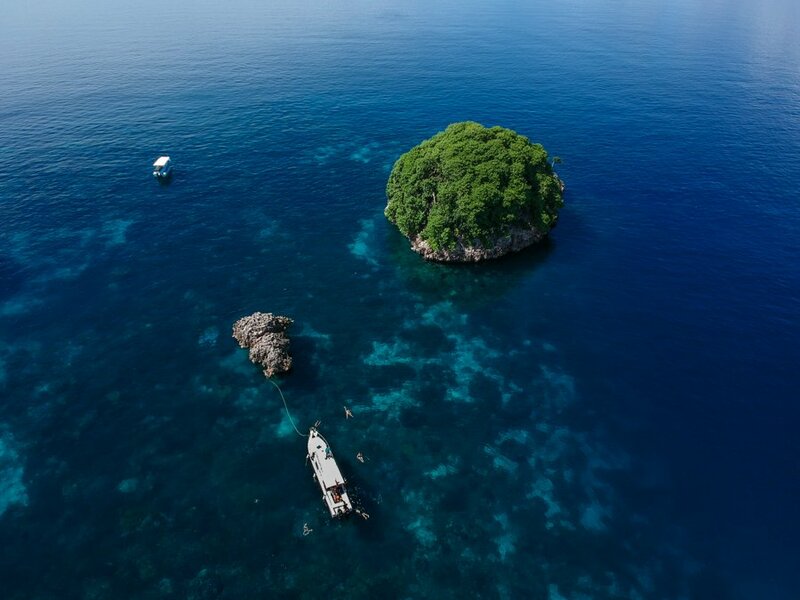 The prices are quite high for R4DR, both for the diving and the accommodaiton itself, but many accommodations around this part of Indonesia are expensive and given this place is known to have the most diverse fish life on earth, I suppose they can all charge a premium. While this region of Indonesia is one of the more expensive places to dive, it’s also one of the best so you have to expect to pay a bit more than comparitively mediocre dive sites like Gili Islands and Bali. I highly recommend purchasing a multi-dive package or asking your accommodation about muti-dive + accommodation + full board packages for further discounts. There are over 30 different dive sites within a few minute boat ride from R4DR and I’m going to start by listing the dive sites we went to on our trip. Call me bais, but I do think that these are some of the best in the region. I will list all others as well so if you plan to do more dives than I did, you’ll know some other top locations to check out. 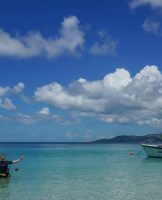 This easy dive is just 10 minutes by boat from R4DR and it’s a fantastic spot. 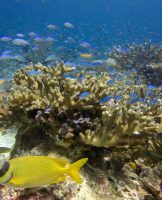 Here you can spot yellow snapper schools, napoleon wrasse, huge groupers, pigmy seahorses, nudibranch and the rare Wobbegong sharks can be found in here as well. This aptly named dive site is one of the best in Raja Ampat due to the mind-blowing marine biodiversity and the variations of coral species. 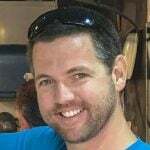 You’ll also find enormous schools of barracudas, jacks and tunas, wobbegong sharks, black tip sharks, white tip sharks and grey sharks. Giant oceanic mantas sometimes like to gracefully “fly” over this reef as well. 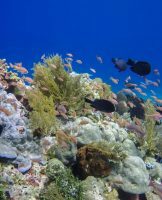 This beatiful dive site is located just off the eastern coast of Kri Island and here you’ll find a ton of coral including oft coral, gorgonia fans, black coral bushes and slopes of coral heads. 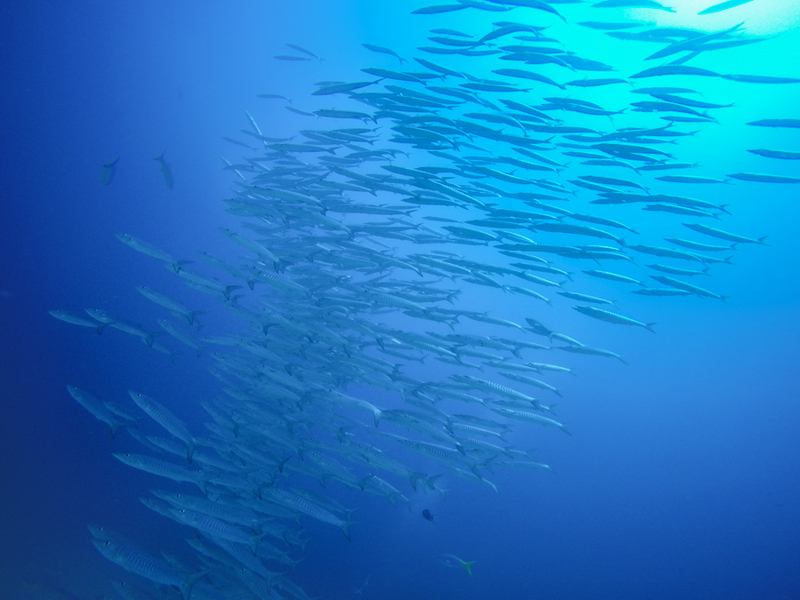 Of course you can find sardines here (hense the name) but also schools of damsels, fusiliers, banner fish, pyramid butterfly fish, barracuda, mackerel, jacks, giant trevallies, sweetlips, triggerfish, and snappers. There are also often black and white tip reef sharks, big grey sharks, napoleons, bumphead parrotfish and groupers. This was definitely one of my favourite dive sites in Raja Ampat. 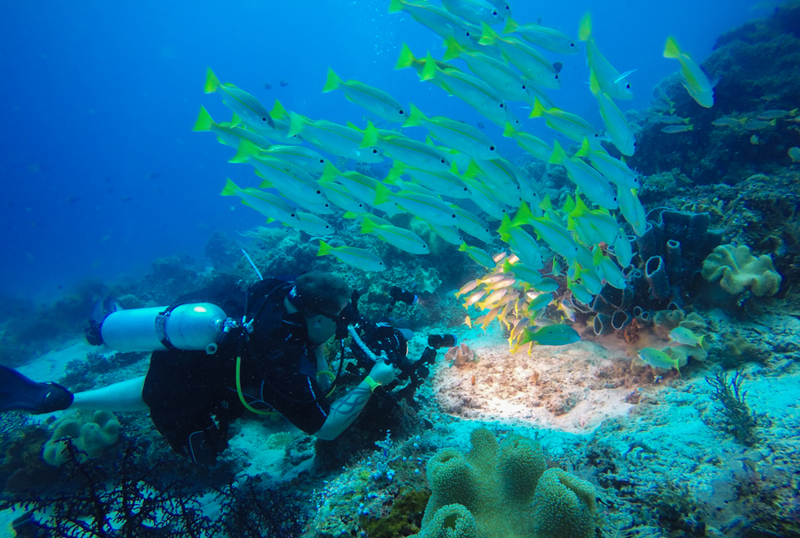 The Melissa’s Garden dive site is located in between the small Jet Fam Islands, northwest of Batanta Island. 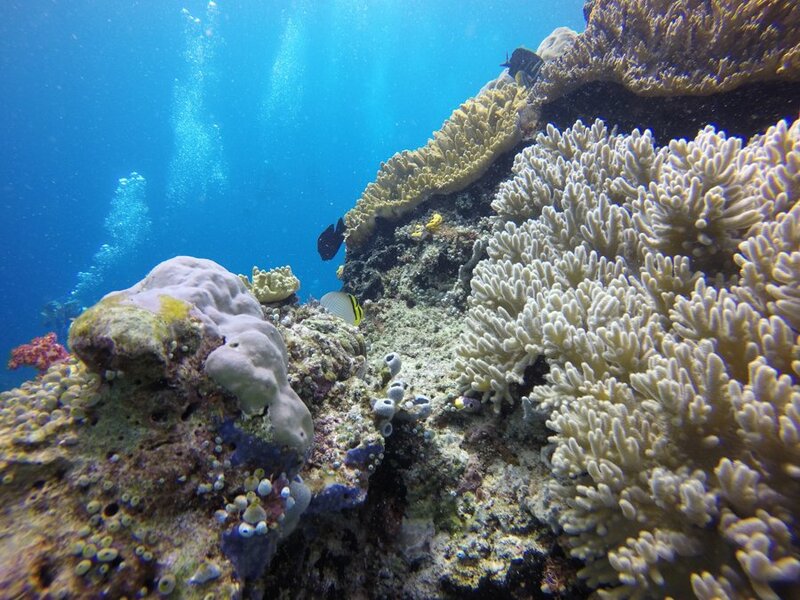 The dive site features an oval-shaped reef with a plateu an top where there are diverse and colorful coral gardens. These gardens are home to bright anemones, nudibranches, soft-corals, sponges & crinoids as well as hard coral outcroppings. For fish life there are pygmy seahorses, angelfish, and lionfish, and in deeper waters, sea snakes, rabbitfish, and wobbegong sharks. 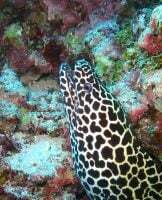 This drift dive runs along a narrow channel at around 25 – 35 meters with towering sheer cliffs featuring spectacular walls covered in colourful sponges and nudibranchs. A mild current pushed divers along the edge of the reef past seafans, seawhips, black corals and table corals. I only experienced the Raja Ampat Dive Resort as a night dive, but I also snorkeled along it as well and it’s pretty amazing. The main thing you’ll be looking for here is the very rare walking shark, but you can also see squid, toad fish, crocodile fish, bat fish, lion fish and blue spotted rays. The reef drops off to around 25 meters just after the jetty ends and there are some nice coral formations and massive schools of sardines that swim under the peir along the hill as it dips deeper into the sea. Want More Scuba Diving Posts? The Pacific currents from the flow of sea along the eastern shores of Kri Island make this a plancton rich dive site, attracting massive schools of fish. The world record for most fish species registered in a single dive was broken here back in 2012 and currently sits at 374 species, making Cape Kri the richest dive site known to science. Most days you’ll find enormous schools of barracudas, trevallies, fusiliers, dogtooth tunas, bumphead parrot fshes, huge groupers and napoleons, black tip shark, white tip shark and grey sharks. The shere number of fish on this dive made it one of my favourites of the entire trip. All I can say from this dive is “WOW”. The shere number within the massive school of yellowstripe scad and jack fish that have found refuge under the Arborek peir is astonishing. We dove down to about 10 meters and looked up at the massive swirling bait ball from below, while a few others were free diving, peircing the massive fish tornado as they swam though it. The scene was like something out of BBC’s Planet Earth and I couldn’t get enough of it. I too swam back and forth throught the cloudy mass of flashing silver, bewildered by the perfect syncronicity of their movements. Batu Lima: Intermediate dive between 15 – 24 meters with medium to strong current. You’ll see schools of Fusiliers, Triggerfish, Unicorn Fish and Black Tip Reef Sharks. Fransisco’s Peak: Beginner to intermediate dive at 5 – 20 meters where you can spot ghost pipefish and many blue spotted rays. Friwin Island: A beginner dive at 5 – 15 meters with little or no current, here you will see a beautiful coral garden with colorful Anthias, Wrasses, Fusiliers and Triggerfish swimming between tight clusters of hard and soft corals. Mike’s Point: Despite US military bombing of the adjacent island in WWI, the reefs at this dive site have recovered incredibly well. Here you can spot wobbegongs, Epaulette Sharks, Turtles, and sea snakes. Misool Stingless Jellyfish Lakes: There is plenty of world-class diving around Masool island, but if you take a trip into Lenmakana’s Jellyfish lake, you can safely swim through clowds of stingless jellyfish that have been famously filmed on BBC and NatGeo documentaries. 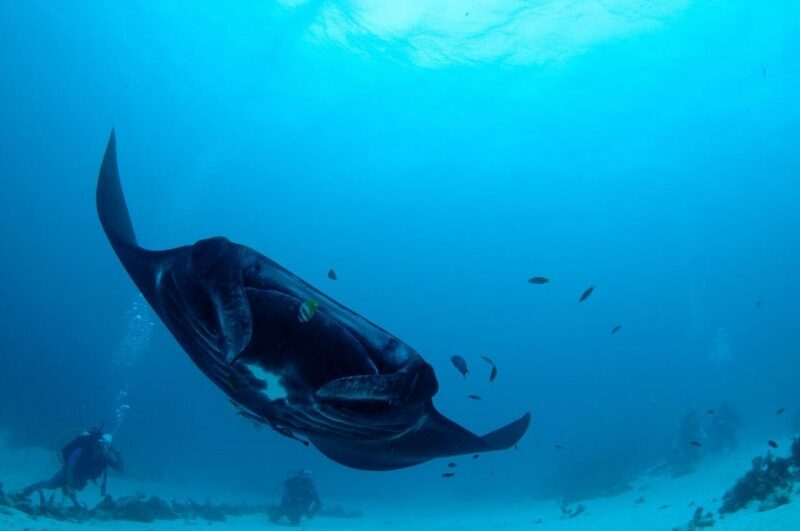 Manta Sandy: A very easy dive at around 5 – 18 meters with medium to strong current (the current brings in the mantas). Chicken Reef: A more difficult dive, chicken reef is around 5 – 20 meters of depth with unpredictable currents, here you can spot large numbers of fusiliers and other colorful fish inhabiting the coral, but also keep an eye open for pipefish, nudibranches, flatworms, pigmy seahorses, and many unique species of crabs and shrimps. The Passage: Another famed drift dive in Raja Ampat though a tight passage between Waigeo and Gam Islands. Kakatua: Bank reef in the marine lake between Waigo and Gam. Loads of clown fish and nudibranches. Urai: A beginner dive at 5 – 20 meters, this is where you can swim into the entrance of the lake mentioned above. Kabui: A very easy dive at maximum 15 meters you can find some rays and turtles here. Andrea’s Point: Another very easy dive with a max depth of around 18 meters and no current. Cross Over: A very advanced dive with strong currents and a max depth of 30 meters. Here you can find a lot of big palegic like sharks and baracuda, jacks and tuna. Ransiwar: A good beginner’s dive at 25 meters where you can find ghost pipefish and lots of cuttlefish. Yenbuba: Another very easy dive that goes down to 25 meters with little or no current. Look for schools of baraccuda and fields of staghorn hard corals. West Mansuar: This is a very currenty, very difficult dive with a max depth of 35 meters and heavy currents almost every day. Look for sweetlips, sharks and massive schools of barracuda. Mangroves: The deepest point of this beginners dive is 25 meters, but the dive usually ends in the shallows of the mangroves where you’ll find many juvineille fish finding refuge in the tangled roots. Koh Island: A beginner’s dive with a max depth of 25 meters and very little current. Here you’ll follow a sloping reef that is set close to Cape Kri, so countless large species of schooling fish are often found here. Ot Di Ma? (Where’s My Guide? ): A very advanced dive with a max depth of 25 meters and very strong currents that bring in massive schools of large shark and tuna as well as many turtles. 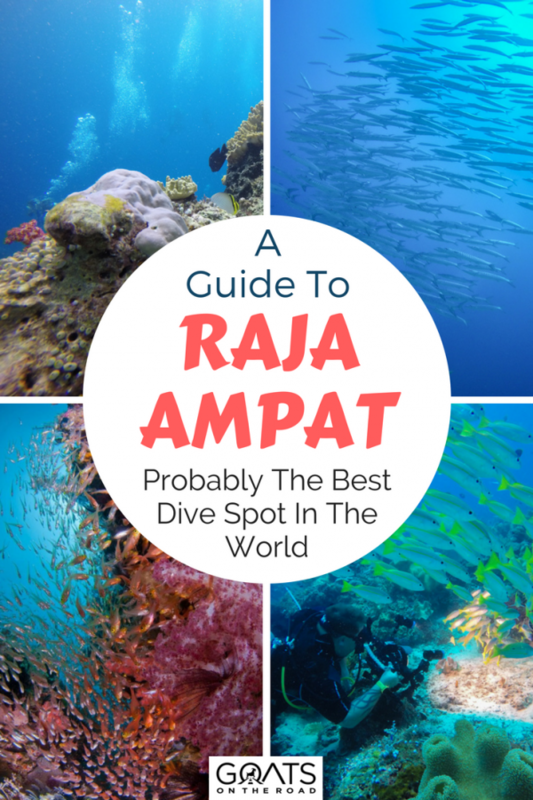 There are countless other dives in Raja Ampat, but I’ve listed the 8 that we did and some of the most popular above. Your dive resort will tell you all of the best dive sites within boat distance from their peirs. When people start planning a dive trip to Raja Ampat, they immediately notice that the prices are much higher than most other places in Southeast Asia and even become expensive on the global scale of diving. But if you plan to do larger dive packages (10+) and you book your diving, room and board all together in the same resort, you can really save some serious money. The cheapest dive resorts you’ll find will be around $55 per night including basic food for a basic double room with a shared bathroom. Diving will then be charged separately and the cheapest I found it online was for around $40 – $45 per dive, depending on what dive sites you choose and how far they are from your resort. When prices really start to go up is when you include day trips to Piyaynemo Islands, The Passage and Arborek Village. These day trips can be as high as $150 per person, so they add up quickly. 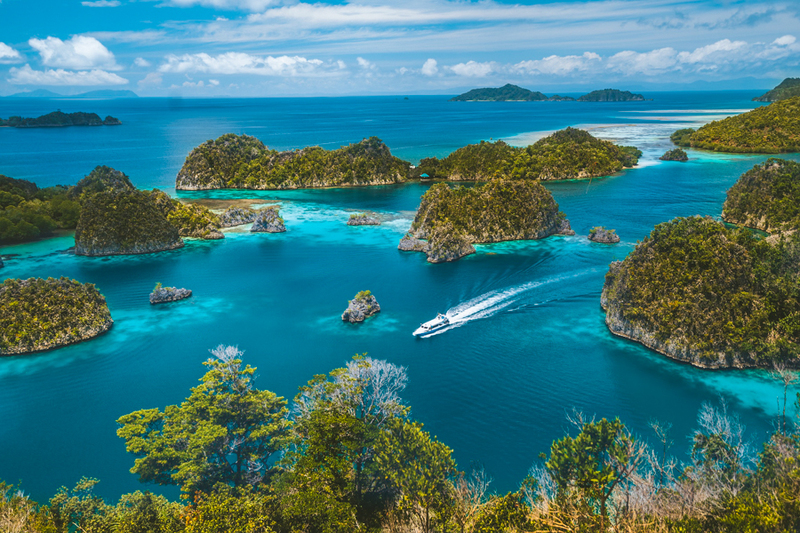 The flights to and from will cost around $200 so yes, the costs do add up, but if you’re planning to splurge on one diving trip, Raja Ampat should be it. 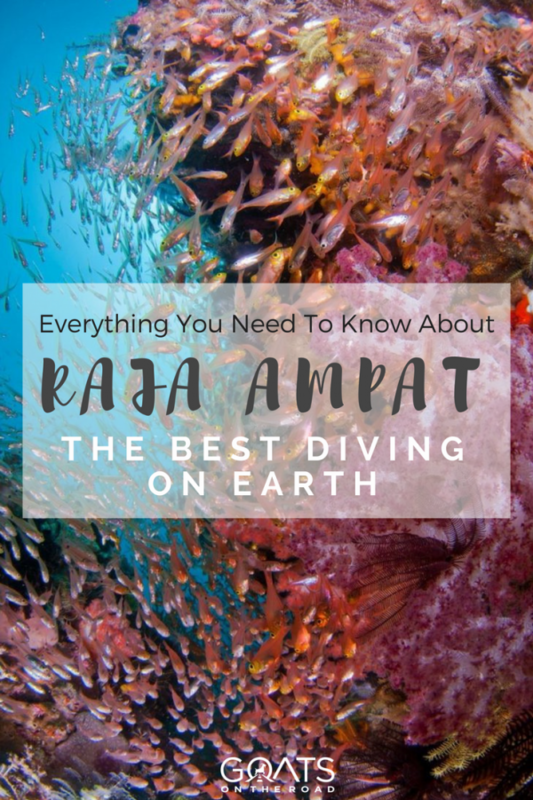 It’s also worth noting that there are numerous intermediate to advanced dives in the area with heavy currents, so it’s a good idea to have your advanced diving certification and at least 20+ dives in your log book before visiting Raja Ampat. 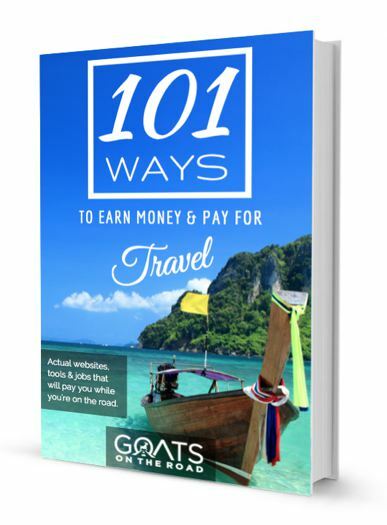 This isn’t 100% necessary, but I think you’ll be able to make the most of your trip if you have some experience. While there is a new hyperbolic chamber in Waisai, located at the Rumah Sakit Umun, it is still recommended that you keep all of your dives in Raja Ampat to no-deco dives and that you have good scuba diving insurance. 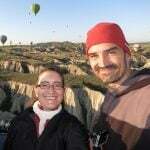 We have used and recommend World Nomads Travel Insurance on this blog and while our links are affiliate links (meaning we recieve a small comission if you use our links, but you don’t pay anything extra), we recommend them out of personal experience, not personal gain. Raja Ampat is a diving mecca, but there is more to this bio-rich archipalego than just scuba. We did plenty on land as well. Here are a few of the best things to do in the region for those of you who don’t plan to don a mask and fins. Without a doubt Raja Ampat’s most famous tourist attraction, drawing even more numbers than some of the best dive sites, Piaynemo is a sight to behold. A massive cluster of islands are connected by perfectly white sand bars. There is a lookout on Piaynemo Island itself where you can get the best vantage (aside from with a drone) and it’s truly specacular. 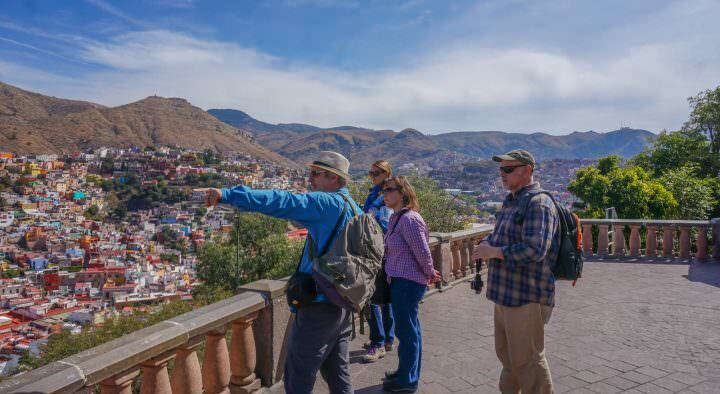 This is known to be one of the most scenic lookout points in the world and when you gaze over the edge of the wooden railings, you’ll see why. The islands bob in the aquamarine waters like jewels in an oceanic showcase. Getting to the islands is expensive (around €100 per person) but if you make a full day of it, it’s worth every penny. Some day trips will take you throught The Passage after a trip to Piaynemo and it’s definitely worth the detour. The boat will cruise through glass calm waters that are protected by towering cliffs on both sides. The channel takes about 15 minutes to pass through and it is one of the most scenic areas in all of Raja Ampat. We were lucky enough to be welcomed into the Arborek village with a traditional dance and parade through the streets, but even without the ceremony, the island itself is picturesque. Arborek is also home to one of the coolest dives in Raja Ampat, so after you’re done meandering through the grid of colorful homes in the village, hop of the jetty and get lost in schools of yellowstripe scad and jacks. 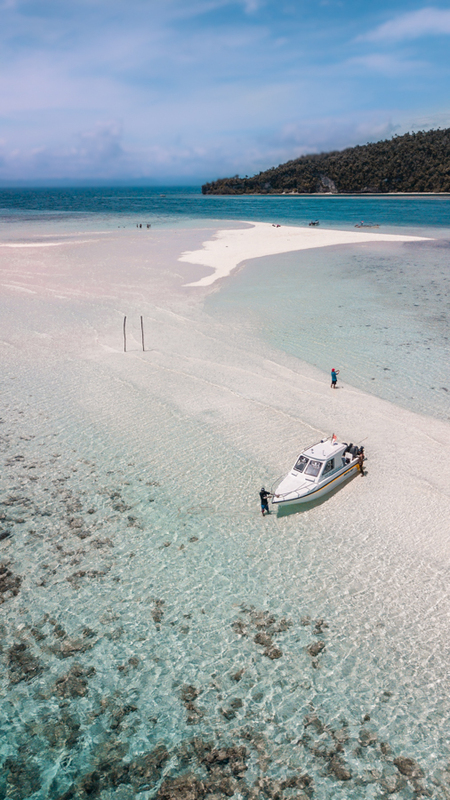 There are quite a few sandbars dotted throughout the Raja Ampat archipalego and I’m not even sure which one we ended up on, but ask your driver and dive guide to take you to a sand bar so you can walk around and go swimming. They appear out of the middle of the sea and some of them aren’t attached to any islands. They’re just perfect strips of bright blue and white emerging from within a cluster of jungle clad islets. Between the islands of Sumalelen and Sumbayo you can find strange hand print paintings high up on rock walls where it would be seemingly impossible to climb to. Some estimates put these hand prints at 55,000 years old. Should you go to Raja Ampat? Of all of the dives I’ve done in my life (exactly 100 at the time of writing), the dives in Raja Ampat are all amongst the best I’ve done. As far as a singular dive location with everything an avid diver could want, Raja Ampat ranks as my favourite in the world. To put my claims into perspective for those of you who are new to this blog, I’ve dove in the Red Sea in Egypt, Mozambique, Tanzania, Sipadan in Borneo, Thailand, Malta, Greece, Grenada, Belize, Mexico, St. Vincent & The Grenadines, Gili, Komodo, Alor and many more world-renowned locales. Raja Ampat probably has the best diving of all of the places I’ve been. Not for one specific dive, but for having such a wide variety of excellent dives and such an astonishing diversity of marine life, including fish, coral and larger mamals. If you’re looking to eperience an epic scuba diving expedition, than I would definitely recommend heading to Raja Ampat. To get the most out of it I would recommend that you have at least your advanced certification and 20+ dives under your belt before going, as some of the dives are more advanced. The price of getting to Raja Ampat and the cost of the dive resorts can be limiting for those travelling on a budget. The cheapest resort I found was $55 USD per night for 2 people including food and most places charge around $45 / dive or more. But you pay a premium to be in Western Papua (known for being expensive) and for diving in the richest coral reefs known to science. For dive buffs, or people just getting into diving, Raja Ampat offers a bucket list dive experience that will blog the fins of of any diver, no matter how much experience they have. All I can say is, if you love diving, make the trip. Dont Miss Our Diving in Raja Ampat Video! Really an amazing place! I felt like I was diving right there with you. The video was that good. Also it’s good to see all those drone shots. They give such good perspective. We loved Arborek too, and Melissa’s Garden was also my favorite. We were not impressed by Blue Magic but it was after a storm with limited visibility. 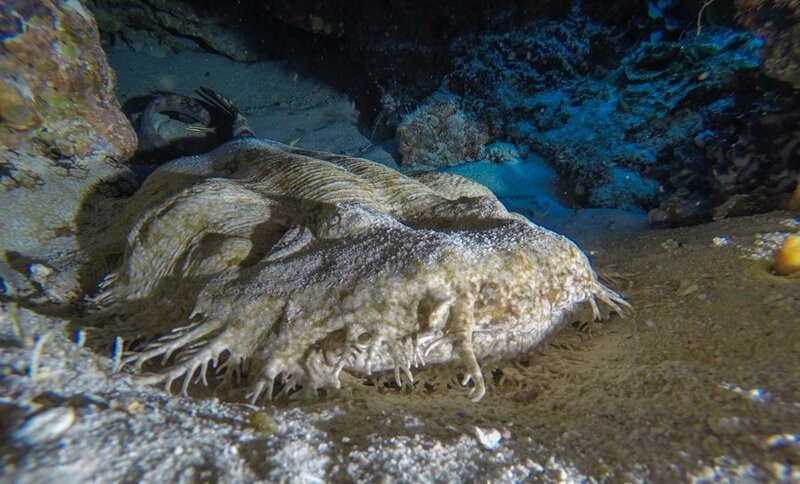 One of the highlights were these Wobbegong sharks, so unique! Did you get to see a Manta in Raja Ampat? 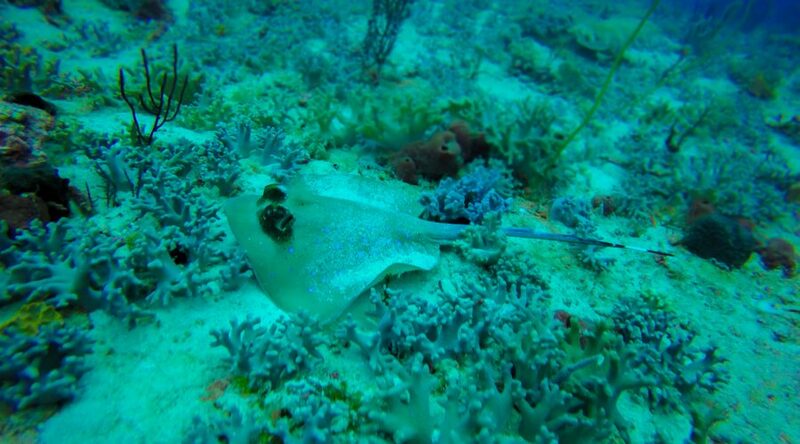 We did not see any in Manta Sandy but got lucky to spot one in Mioskom – it was awesome! Your underwater photos are extraordinary. That must of been a fun experience for you. Nick this is great! It is such a lovely article and I find that the photos are lovely as well. It’s just amazing how you put all these together on “Diving In Raja Ampat: The Richest Marine Biodiversity On Earth” with such great tips! Looking forward to more of these. Thanks for giving such a wonderful information. It is very helpful for every traveler. 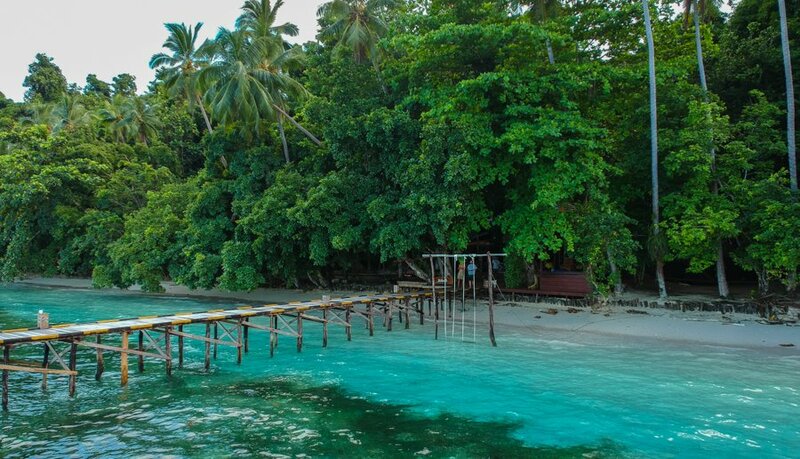 Great post about Raja Ampat. Raja Ampat is an amazing place. I have lived and worked on one of the islands in Raja Ampat, managing the dive centre. 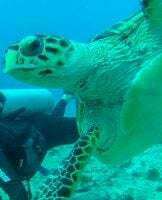 I have dived a lot and have been amazed how rich and diverse the marine life is in this part of Indonesia. It’s a bit hard to get to Raja Ampat but once you are there it’s really amazing. We have mostly dived the dive sites towards the north but for day trips went down to Dampier Strait. To get to our island from Sorong, we had to go through the passage. That was always lots of fun with the crazy currents.